Governors portrait of Wilson Shannon that hangs in the Ohio Statehouse. He served as the 13th and 15th Governor of Ohio, from 1838-1840 and 1842-1844. Wilson Shannon was the first governor to be born in Ohio. He was born near Mount Olivet, Ohio, on February 24, 1802. His parents, George and Jane Shannon, had moved from Virginia to the Northwest Territory in 1800. Wilson Shannon was the youngest of nine children. When Shannon was only one year old, his father froze to death while hunting. After his father's death, his older siblings helped to support the family. Several of his older brothers were lawyers, and they paid his tuition so that he could attend college. Shannon attended Ohio University from 1820 to 1822 and then attended Franklin College briefly before transferring to Transylvania College in Lexington, Kentucky, in 1823. He did not graduate from any of these institutions, deciding instead to study the law. He passed the Ohio bar examination in 1830 and began to practice law in St. Clairsville, Ohio. Shannon soon became interested in politics. He unsuccessfully ran for the United States House of Representatives in 1832, ultimately losing by only thirty-seven votes. 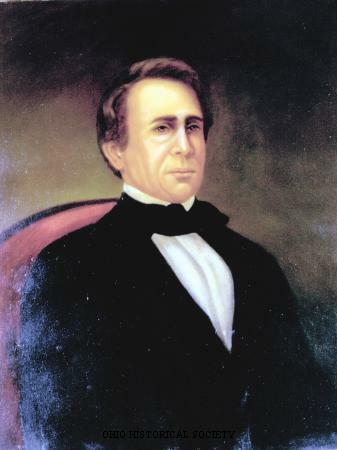 In 1833, Shannon won his first elected office, prosecuting attorney for Belmont County. Two years later, he became prosecuting attorney for the state of Ohio. It was during this time that Shannon became a member of the Democratic Party. Shannon ran for governor on the Democratic ticket in 1838, defeating Joseph Vance. Although not many people knew Shannon outside of his home district, problems with the state banking system and currency caused voters to elect him instead of Vance. Shannon became the state's fourteenth governor. During his administration, Shannon worked to improve the state banking system and decrease the state debt. He did not win reelection in 1840, however, because of the prominence of the Whig Party at the national level. Instead, Whig Thomas Corwin became governor. Shannon ran again in 1842 and became Ohio's sixteenth governor during his term from 1842 to 1844. Shannon resigned from his position as governor in April 1844 when President John Tyler appointed him minister to Mexico. During his time in Mexico, relations between the United States and Mexico deteriorated. Shannon returned to the United States in March 1845 as the United States began to prepare for the Mexican War. He resumed his law practice in St. Clairsville and practiced law in Cincinnati. Between 1849 and 1851, Shannon participated in the California gold rush, leading a group of miners west. After returning home, Shannon ran successfully for the United States House of Representatives and represented Ohio from 1853 to 1855. In 1855, President Franklin Pierce appointed Shannon to be governor of the Kansas Territory. He served as governor until 1856, when he voters removed him from office. Shannon's time as governor of Kansas was particularly difficult. The territory was organizing for statehood, and there was much debate over whether slavery should be allowed in the new state. The debate was contentious and even violent at times. Although he was no longer governor, Shannon chose to remain in Kansas after 1856. He began practicing law in Lawrence, Kansas, and remained there until his death on August 30, 1877. Day, Donald Eugene. "A Life of Wilson Shannon, Governor of Ohio, Diplomat, Territorial Governor of Kansas." Ph.D. diss., The Ohio State University, 1978.